Use this Choice 20 qt. standard weight aluminum stock pot for a number of everyday kitchen tasks! This stock pot is perfect for throwing together a soup-of-the-day, steaming fresh vegetables, or whipping up a whopping batch of creamy mashed potatoes. Thanks to a wide base and high walls, this versatile pot can cook nearly anything inside. this standard weight aluminum stock pot is absolutely great for cooking great quantities of food for our restaurant. this pot is also easy to clean. Big, lightweight and sturdy. This 20 qt stock pot is perfect for medium to large batches of soup and stew. It reaches the right temperature fast and holds it long enough. Heavy duty aluminum stock pot that doesn't dent easily. Great for cooking soups or stews. Heats up evenly on a stove top and easy to wash.
Good size stock pot, using an all aluminum stock pot is easier to haul and carry around as it is lighter. Its perfect to cook small size stocks. Sturdy, lightweight pot with solid handles. Because the pot lightweight it doesn't get too heavy when it's full of liquid, it's still very manageable. The handles don't feel like they will ever buckle under the weight of a full pot. I bought 2 of these stock pots. They seem like a really good quality. I don't actually cook any food in them. I use them when I need to create a water bath for some hard as a rock royal frosting. Very lightweight, no frills, economic, aluminum pot. I use it every other day. Does the job as intended. Very large pot will cook 6 #10 cans (18 quarts) plus other ingredients. Just be careful not to burn product on the bottom. Must keep stirring or use lower heat. For serious cooking you need a serious sized stock pot, and this 20 quart pot is a solid choice for it. It is thick aluminum and is very affordably priced. As a plus it is made in Korea instead of China. We use these stock pots for absolutely everything in our kitchen, and they have never ever let us down. Really high quality, and well worth the price. Works as intended. This is a more affordable option and has lasted for 7 months of light use with lots of life left. We would recommend. The pot is large for boiling large items and such and for that it gets 3 stars. However, I purchased this item, along with the 20 qt. Aluminum stock pot steamer basket and was disappointed. This pot overwhelms that basket. I also didn't realize that when I purchased the pot that it didn't come with a lid. This was disappointing too, as I was steaming vegetables and had to go borrow a lid that fir that pot. Would recommend with caution. For the volume of business we do this is a great medium size pot for us. I am very grateful how quickly it arrived, we were heading into a very busy memorial weekend and this stock pot arrived in 3 days. As soon as I unpacked this beauty we started using it to make mashed potatoes, cheese sauce, boil pasta and make multiple BBQ sauces. I think it spent 6 hours on the stove top the very first day and clean up was quick & easy. This is a good, heavy duty pot. Definitely not the prettiest or most polished out there, but it does the job well. Very large! See picture for size reference. Excellent Pot for my application in the spice mixing business. Couldn't be happier with this purchase, and if your someone who loves soup, this pot would be perfect if you like larger batches that you can freeze for lunches. Keeps the employees happy. The size and price are great. However; I find this pot much harder to clean compared to others I own. It's worth the price and the extra effort, just wanted something easier to clean when I'm making large batches of stock. The other downside is the straining process, but that always takes work when using such a large pot. We purchased this stock pot to serve in multiple jobs. We use it for frying and as a soup pot. It's sturdy and cleans easily. High quality stock pot, very low price! Immediate shipment with receipt right away. This was offered at 1/2 the cost as our regular supplier. Used and abused almost daily and still looks brand new! My wife loves it!! We have gotten rid of some of the cheap stainless stock pots now that we have this heavy duty one! Well built and a great price. This standard weight is heavy and works fine. Why in the world would I need the heavyweight stock pot? This pot has exceeded my expectations. I couldn't believe the price of this pot ! This product exceeded my expectations! It is very affordable! Don't think twice, make the purchase! Great buy! If this is standard weight, I wonder why we need heavyweight! This pot far exceeded my expectations. It is a very sturdy piece of equipment, miles ahead of any big box store stockpot. I opted not to season mine as per the instructions, so the inside is somewhat discolored, but the outside still looks fantastic! Thankfully, the lid to my 5qt saute pan fits perfectly, so I did not need to purchase another lid. Not the best pot. I'm not sure if it was my experience, but for some reason, it wouldn't dissipate the heat evenly-- resulting in the water never boiling. Instead, it just turned the pot an odd color. I don't use it to boil liquids anymore. We just use it to steep hot tea. It is a very hefty stock pot that seems like it should last for a long time. Caked on food can be hard to clean off, but keeping it well seasoned seems to help. Love this 20 Qt Pot. Even heat through out, hasn't burnt anything on the bottom so far & if anything did stick it washes of easily. This is my go-to pot. Highly recommend and best price all around!!! The perfect pot for boiling potatoes. The size is great for the burners as well. Nice and slender versus taking up two burners. Very durable and easy to clean. This was an amazing find at webstaurant, the weight and aluminum quality can't be beat anywhere, it's a sturdy pot that distributes heat evenly and gives you quality results without burning anything. This is what I would call a "medium size". If you need something really big then go for the 24qt or bigger. Overall good construction from top to bottom and easy to clean. Great for the price. These pots are much cheaper than their stainless steel counterparts but work well! We cook our sauces in them daily. However you should definitely read the instructions that come with them or you'll be wasting your money! You have to season them! 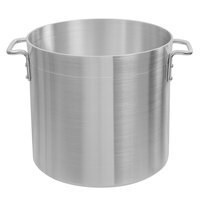 This 20 quart standard weight aluminum stock pot is very high quality! It is very sturdy and has lasted through lots and lots of stovetop use. A little thin on the walls but perfectly useable. My cook needed more of a utility (food) bucket than a cooking stockpot, but in the end we've used it for both successfully. Great 20 quart stock pot for the price. I bought this to be in the middle of my 10 quart and 24 quart. Very durable. Great value if you just need to boil pasta or cook potatoes. The unit is easy to clean and holds up well to moderate usage. This is a really good sized pot for sauces, stews, soups, etc. It's sturdy and well made. I'll keep buying from this site, the price is great.